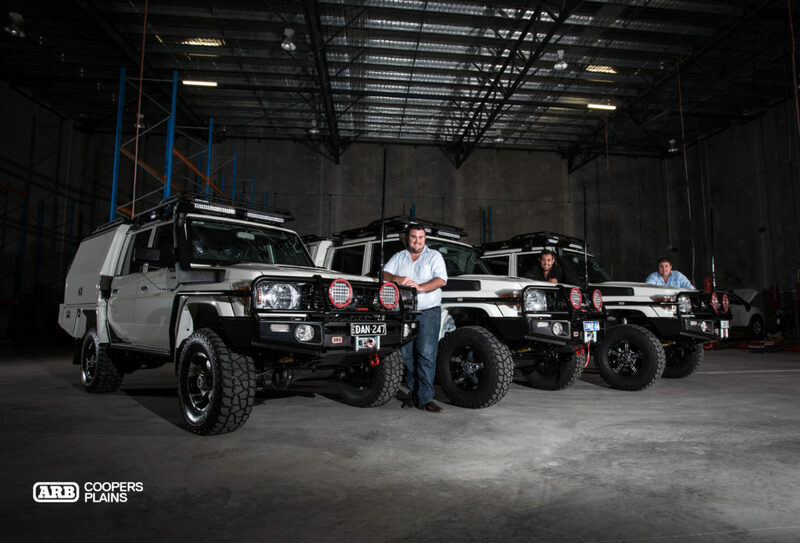 Shortly after ARB Coopers Plains created The Dark Knight 79 Series dual cab, we were approached by Dan, Jon and Dave to build not just one, but a trio of very special Toyota 79 Series dual cabs. The Dark Knight had become an attraction in our showroom for a few weeks and obviously caught the eye of the three men. 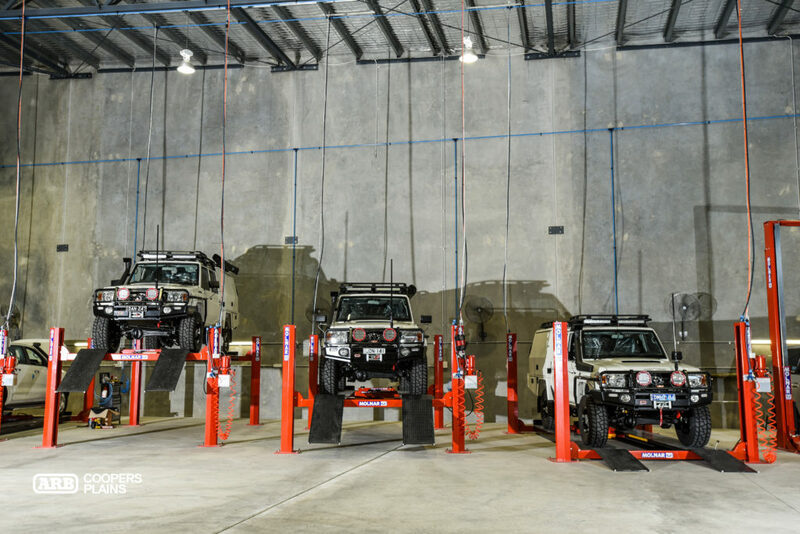 After speaking with the ARB Coopers Plains team, they arranged for their very own dual cabs to receive the same treatment. 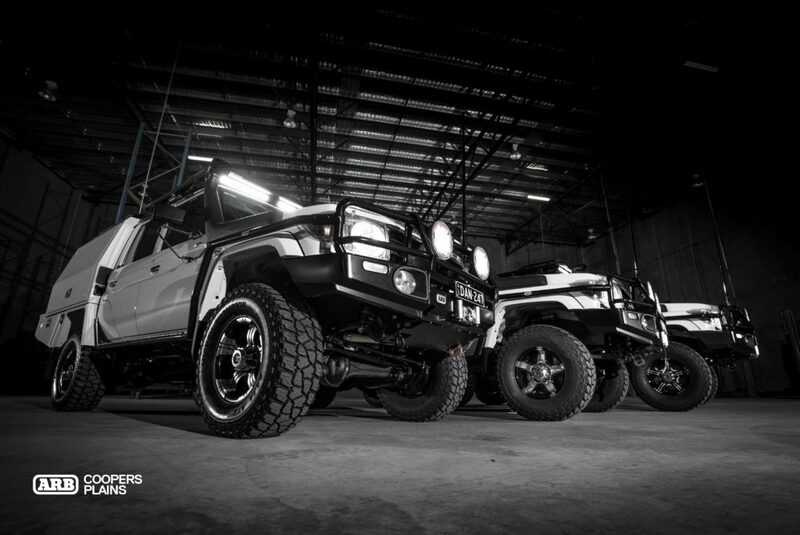 While these LandCruisers are all similar they do bare some subtle differences to accommodate for individual tastes. 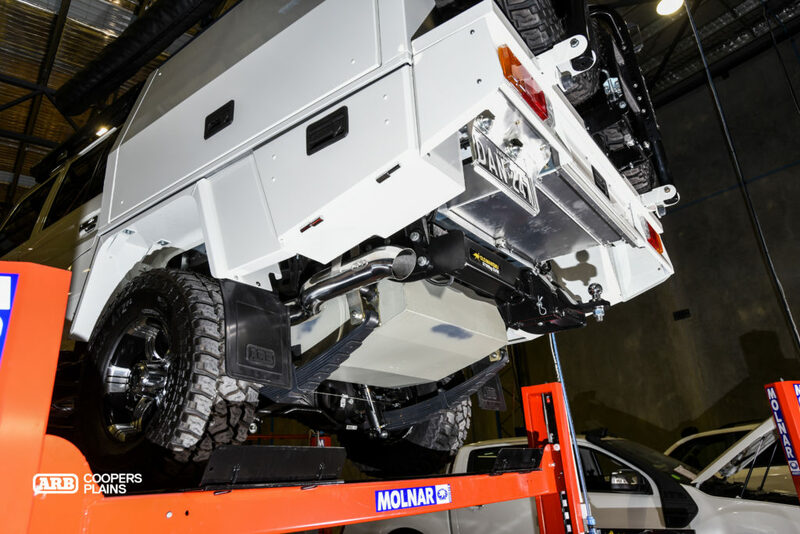 All three received ARB barwork including the front bar and side rails and steps. All ARB products are designed to integrate with each other. Consideration has been given to mount other popular accessories without modification to other components. Only the best lighting was used in these builds. 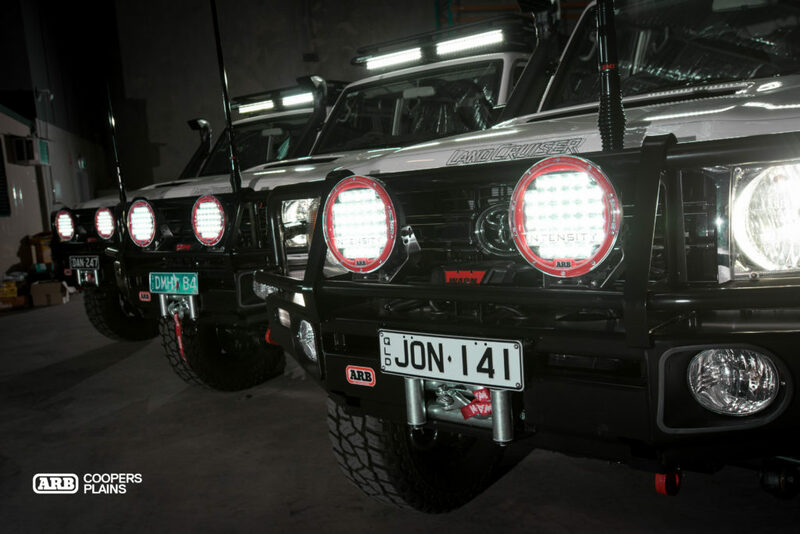 As well as the light bars mounted on the Rhino Roof Rack and the LED headlight upgrade, the ARB Intensity Lights take pride of place on the front of each vehicle providing spectacular vision ahead. The ever reliable Warn Zeon Platinum 12000lb winch sits patiently behind the bar, waiting for the moment it’s called upon to save the day. Fast line speed and an IP68 rating make this one tough winch. Recovery points are a necessity for any four wheel drive trip and most four wheel drive clubs. While the factory hook looks sturdy enough to tie the dog to, we replaced it with an 8t rated recovery points, ensuring that it will hold in any recovery situation the boys find themselves in. The Toyota intake may look like a snorkel, but the unit is not sealed, which means bad news on water crossings. 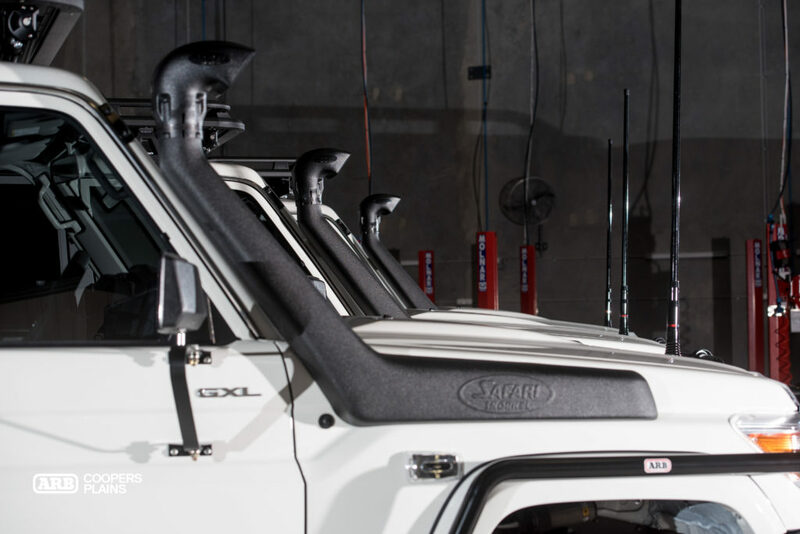 Safari Snorkel offer a fully sealed snorkel to replace the factory intake, giving better airflow, increased performance and reassurance on those deep water crossings. 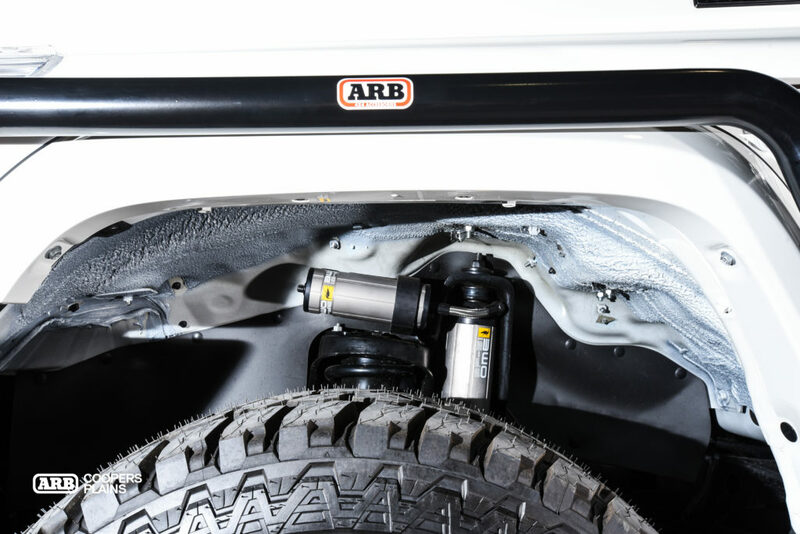 Naturally, the ARB differential breather kits were installed at the same time to prevent water from getting into the diffs. 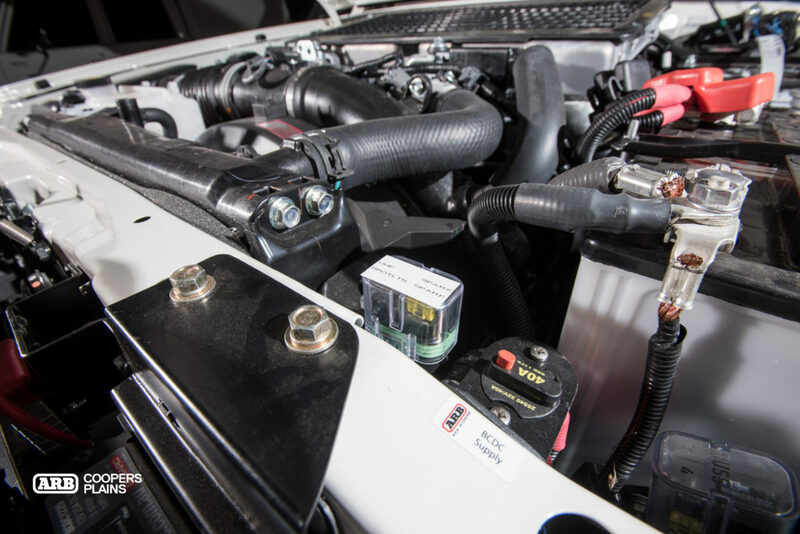 180L diesel tanks made by The Long Ranger were installed in each vehicle to increase fuel capacity, which means more kilometres travelled and less fuel stops. Made from 2mm aluminised steel, they are incredibly strong and built for Australian conditions and a great addition for both remote travel and daily travel. OME BP-51 Suspension provides unbelievable ride control for the big Cruisers. All three have been fitted with the racing style, bypass shock coupled with appropriate springs and allowing for the GVM to be upgraded. With a simple adjustment using the provided tool, the compression and rebound can be tailored to personal preferences or trip requirements, giving a much more customised ride over a standard shock. As well as shocks and springs, the OME kit also consists of caster correction, upgraded sway bars, greasable shackles and all the necessary brackets bring it all together. Talk to anyone who owns a 70 Series and they will tell you about the difference between the front and rear wheel track. 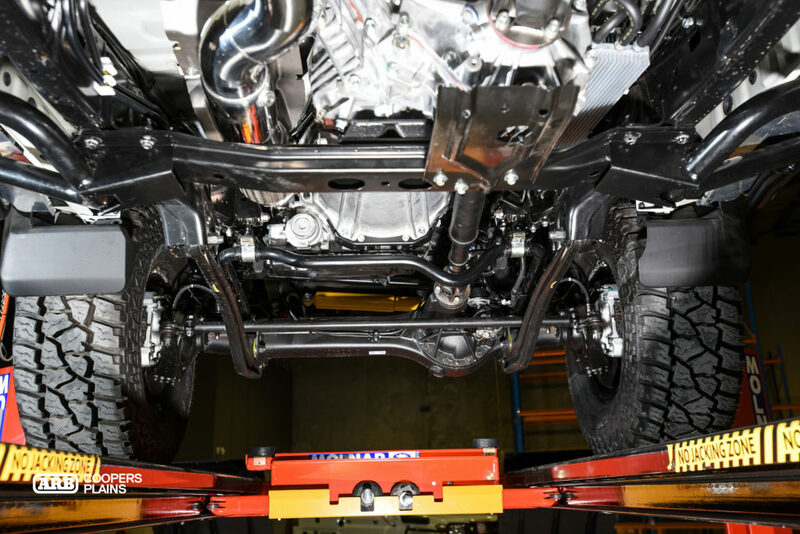 All three vehicles received a TruTracker to legally widen the rear axle and bring it close to being in line with the front axle. For people towing or carrying big loads this is a great modification. If you use your car on the beach or live close to the coastline, an Electronic Rust Protection System (ERPS) should be installed. 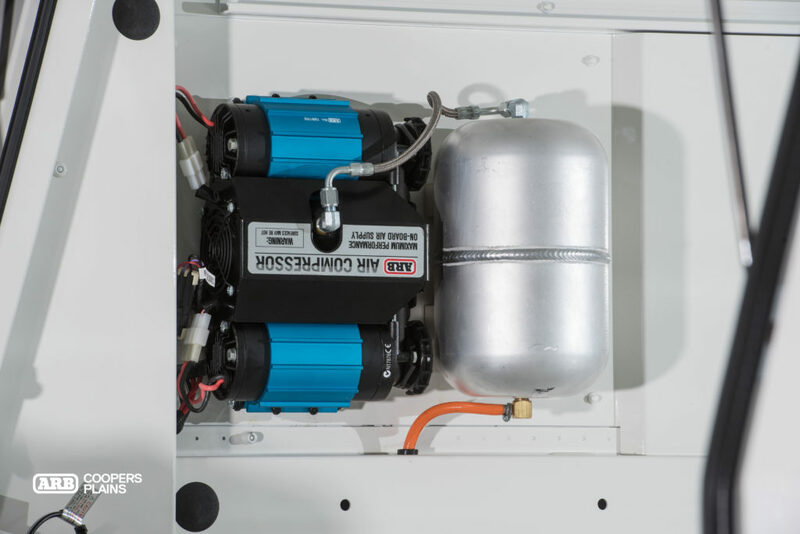 A generator delivers a charge to the couplers fitted on the vehicle, acting as a positive plate of a capacitor. A negative charge is created by the vehicle’s metal surface and the paint acts as a dielectric, holding the static charge. This interferes with the electrical charge between iron and oxygen, making it hard for them to combine and form rust. A 6-pad system was fitted to each Cruiser. Whether it’s on the tracks or on the job site, the boys love to have a chat. Australian made GME UHF radios have been installed and paired with the black fibreglass 6.6dB aerials. 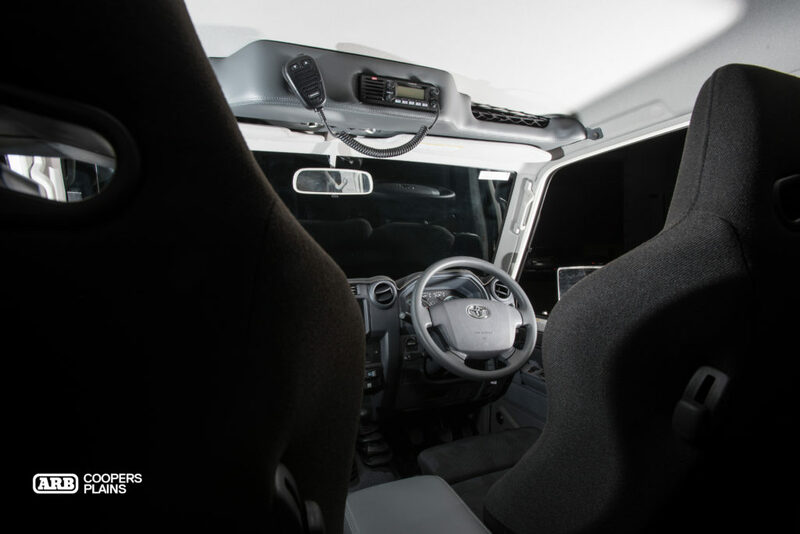 With placement options almost non-existent in the dual cabs, Department of Interior roof consoles were fitted to allow for more storage and provision for a TX4500 UHF. These feature two map lights and two mesh pockets along the windscreen. Department of Interiors also provided the custom centre floor console, allowing for even more storage and proper cup holders. Kids entertainment is taken care of with Northfield Car Sound installing roof mounted screens and speakers with a new dash unit going in as well. Toyota has left a lot to be desired when it comes to seating in the 70 Series. Recaro has a range of options available to suit all types. The boys have selected the Cross Speeds with lumbar support built in for extended drives. With only the best used for this build, Redarc makes an appearance for both the brake controller and the dual battery system. A BCDC1225 coupled with a 79Ah DEKA battery gives them enough power to keep the fridge and all the ancillary items running when it matters most. 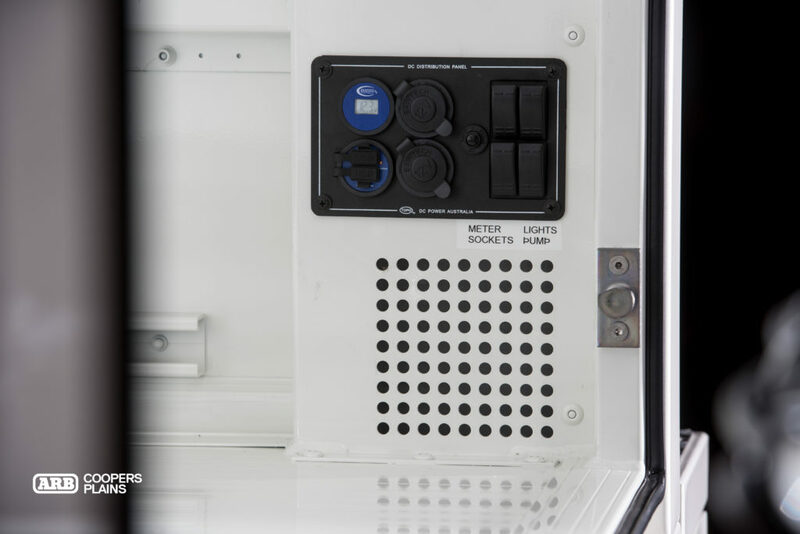 A Baintech power panel finishes off the system with a voltmeter, switches and power outlets. 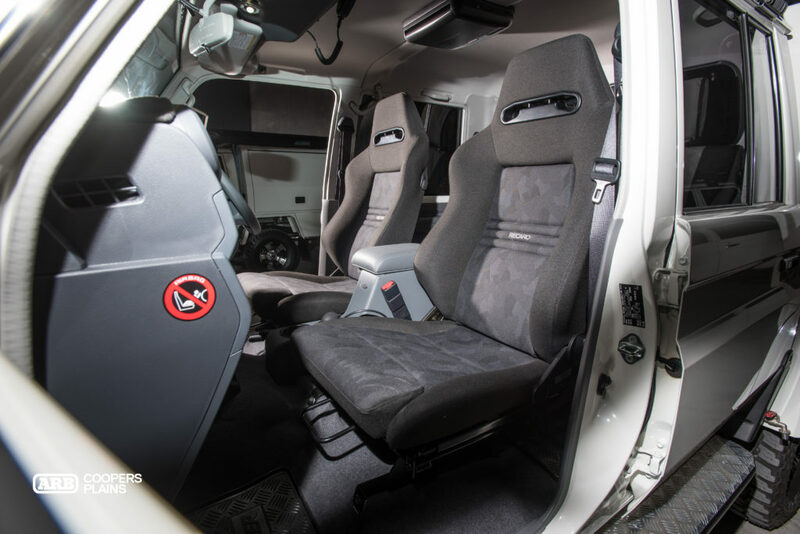 Fitted to the back of each dual cab is a CSM canopy modified to ARB Coopers Plains specs. Twin Rhino Rack Pioneer Platforms are mounted to both the cab and the canopy, providing an even surface across the two roof areas. 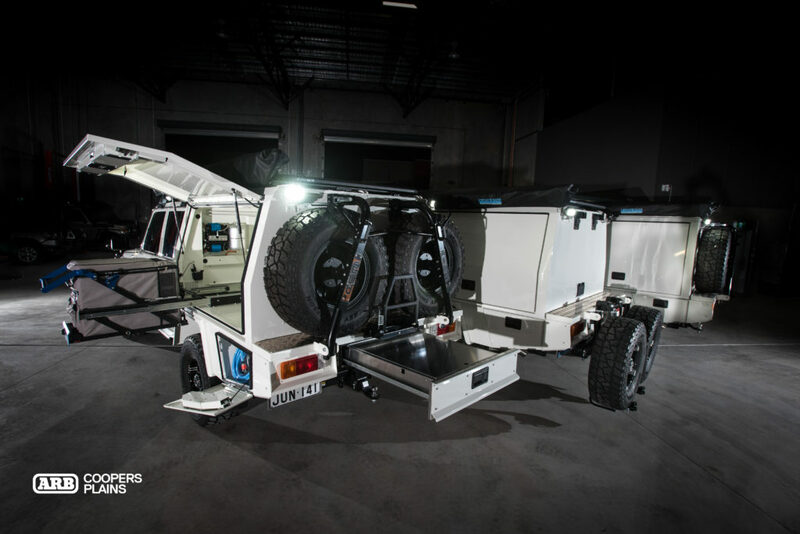 The canopy features twin fold down wheel carriers, underbody tool boxes, underbody 53L water tank, rear pull out drawer and internal lighting. 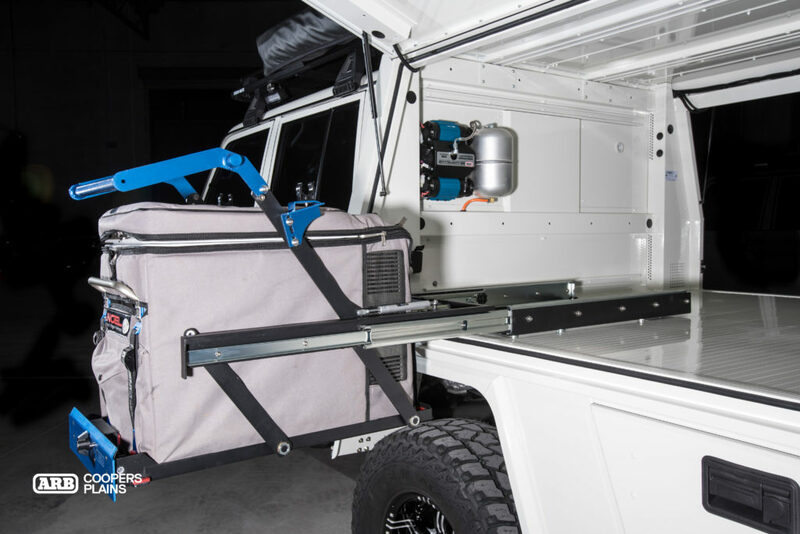 Inside the canopy offers plenty of storage, and even has a twin motor ARB compressor for use with air tools or simply inflating tyres when they are done on the tracks. 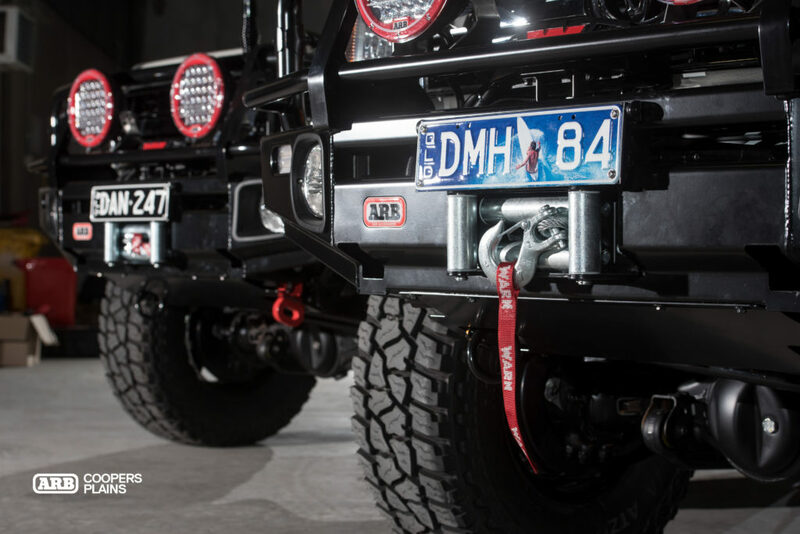 If you want to build your own 70 Series, give one of our team at ARB Coopers Plains a call on (07) 3277 2020 to discuss the options.